Children are twice as likely to be hit and killed by a car on Halloween. camera (Getty Images) Nearly two-thirds of children name Halloween as their favorite holiday. intro: One of the scariest things about Halloween is the high rate of mishaps. The Consumer Product Safety Commission reported more than 3,500 Halloween-related injuries in October and November last year. The statistics aren’t meant to frighten, said Kate Carr, the president and CEO of Safe Kids Worldwide, a consumer safety group. Rather, they’re meant to get parents focused on safety. Here are tips on avoiding Halloween dangers. quicklist: 1 category: title: Traffic Fatalities url: text: Halloween ranks as the third-deadliest day for pedestrians, according to a recent National Highway Safety and Traffic Administration analysis that examined a quarter-century's worth of data. However, it’s the deadliest for kids. Children are twice as likely to be hit by a car and killed on Halloween than on a typical night, a Centers for Disease Control and Prevention found. Carr advised parents to put reflective tape on costumes or have their child carry an item that glows or reflects car lights. She also urged parents to accompany kids younger than 12 on trick-or-treat rounds. “Kids who are younger than that can’t accurately judge speed or distance to gauge how fast a car is going,” she said. quicklist: 2 category: title: Food Allergies url: text: One in 13 American children have been diagnosed with food allergies, according to the allergy awareness group Food Allergy Research & Education. 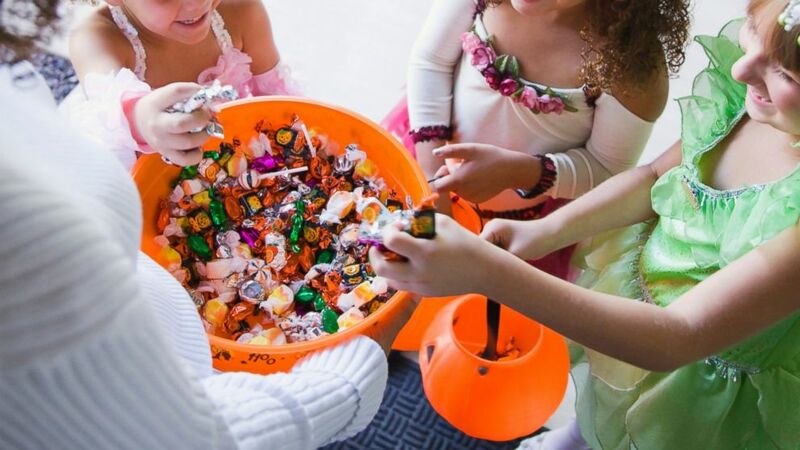 Candy containing soy, wheat, eggs, peanuts or tree nuts can sometimes cause life-threatening symptoms, which means trick-or-treating is usually off-limits to food allergic kids. This year, FARE has introduced pumpkins painted the color teal -- the color of food allergy awareness -- to alert parents to houses that give out small toys instead of candy. People also can download teal pumpkin posters from the FARE website. quicklist: 3 category: title: Cuts and Bruises url: text: Of the 3,500 Halloween-related injuries on the CPSC list, the most common mishaps included burns, lacerations from pumpkin-carving and injuries from collisions related to impaired vision. “If you are planning on carving jack-o-lantern, make sure an adult is present and that a child is old enough to handle a knife or carving tool properly,” said Carr, adding that parents should consider using a battery-operated candles with jack-o-lanterns to reduce fire risk and should ensure masks and headdresses don’t obscure a child’s ability to see where they are going. quicklist: 4 category: title: Stairs url: text: Children ages 10 to 14 sustained the greatest proportion of injuries, a recent study in the journal Pediatrics revealed. They accounted for more than 30 percent of the calamities reported on Halloween day. The most common Halloween-related bumps and bruises came from falling down stairs and tripping on floors -- though about 4 percent of the injuries involved beds and pillows. To cut down on trips and falls, Carr said, parents should take a careful look at their child’s costume to make sure they don’t drag or impede movement. “Tighten up those shoe laces so they are ready to hop, skip and jump from door to door,” she said.